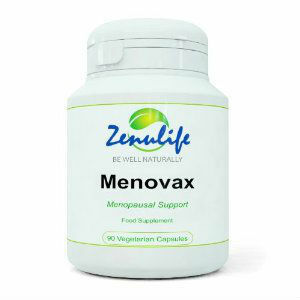 Zenulife Menovax has been especially formulated to help relieve menopause symptoms as it helps rid hot flushes, prevents night sweats and controls mood irritability. It is also suitable not only for women experiencing menopause symptoms but also for women of any age with irregular monthly cycles or having difficulty during this period. What Is Zenulife Menovax Made Of? Pffafia – a Brazilian plant which is also known as the Brazilian Ginseng. Unlike the Asian Ginseng, it has become very popular for thousands of years by the American and Japanese as cure for menopause. Dong Quia – found to be useful in supporting female cycles. Helps reduce menopausal conditions such as vaginal dryness and hot flashes. Wild Yam extract – is a natural alternative for estrogens and help with postmenopausal vaginal dryness. Evening Primrose oil powder – helps with premenstrual and menopausal symptoms. Red Clover – helps reduce hot flashes. Siberian Ginseng – helps with menopause symptoms like insomnia and hot flashes. There are 60 capsules in a bottle and it is recommended to take it once or twice a day. They are also one of the supplements that suggest that you take a higher dose first and that would be twice a day for 10 days before following the lower dose of one capsule a day. A bottle costs $37.00 though they have a special for 2 for $33.50and 4 bottles for $29.25 and the product offers a 60-day money back guarantee. Zenulife Menovax may be considered a top product for menopause problems as it has all natural ingredients and also has a 60-day money back guarantee. One factor to be considered though is the recommended higher dose on the first few days and then going down to the normal dose. This may be a problem to some as the dosage may be higher. There are also no reviews on their site so their claim is unproven. It is important that your product is also proven and tested by a special group that studies the efficacy of the product. Jackie Horowitz	reviewed Zenulife Menovax	on August 27th	 and gave it a rating of 2.5.